In Olympic Style Weightlifting for Strength, Health, Physique, Fitness and Sport, weightlifting coach Jim Schmitz discusses the benefits of Olympic style weightlifting. There’s been a resurgence of enthusiasm for Olympic lifting in recent years, primarily due to Crossfit, and no one is more pleased to see this than Jim. In Olympic Style Weightlifting for Strength, Health, Physique, Fitness and Sport, weightlifting coach Jim Schmitz discusses the benefits of Olympic style weightlifting. There’s been a resurgence of enthusiasm for Olympic lifting in recent years, primarily due to Crossfit, and no one is more pleased to see this than Jim. Beginners who want to hear about Olympic lifting, and old-timers who want to hear about their O-lifting heroes will all appreciate this lecture. Jim Schmitz has been an Olympic weightlifting coach since 1968, and during that time coached 10 Olympians. He’s written a book and developed a DVD on weightliting, and does coaching clinics and seminars. 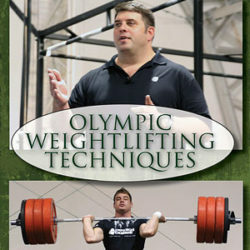 You can connect with Jim to learn more about Olympic weightlifting via his website at physiquemagnifique.com. This is a digital product with immediate access to download. There is no physical version of this product.